Just 8 minutes from downtown Gatlinburg - Cupids Arrow is a 2 bedroom and 2 bath cabin that can sleep up to 4 guests. You can enjoy relaxing in front of the gas fireplace, shoot a game of pool on the pool table, or wind down in the jacuzzi tub or hot tub on the covered deck. A full kitchen, washer/dryer and FREE wireless internet are provided for your convenience. The main level master suite includes a queen bed with upgraded bedding, flat screen TV and DVD player. Head upstairs to the loft game room and shoot a game of pool, or relax in the adjoining loft enclosed bedroom sleeping area with jacuzzi tub. For additional guests, the upstairs bedroom includes a queen sized bed. Ranked #1 by visitors in Gatlinburg, our cabins are less than 5 years old and feature rustic luxury and high end amenities. We pride ourselves on prompt customer service and maintenance should you require assistance during your stay! You'll feel the personal attention of a private home while getting the service and support from an established and professional owner. Gatlinburg can be a little busy! 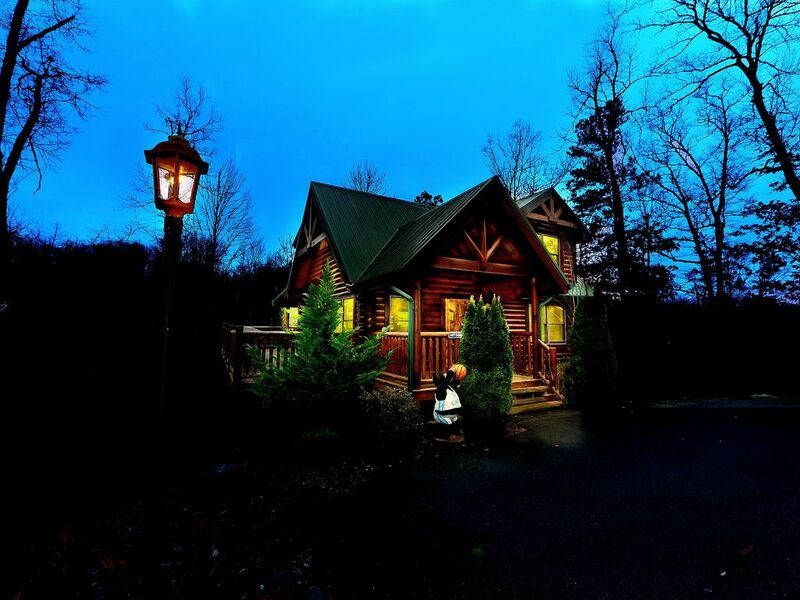 This cabin is located in the Arts and Crafts community which is just 8 minutes from downtown and 10 minutes to Dollywood. So you are convenient to everything but in a unique and secluded area. Bordering the Great Smoky Mountains National park you can enjoy the wooded seclusion while being just minutes from all the attractions. Or, tour over the 100 artisans in the arts and crafts community just 2 minutes away! Amazing attention to detail in this cabin...wood beams, professionally decorated, many amenities. Plus..you get your own private yard, a gazebo hot tub and covered deck with rockers. We appreciate your business and your fantastic 5-star review, Brandon. Cupids Arrow is a perfect cabin to relax in and enjoy some time away from the hustle and bustle of everyday life but still be close to the heart of downtown Gatlinburg and local attractions. We hope you will make plans to stay with Elk Springs again on your next trip to The Smokies. We encourage guests to book direct and save up to 15% on your booking. Hurry back! The cabin was everything we had hoped for. We are pleased to hear your recent cabin stay was everything you needed, Jake. Cupids Arrow is a beautiful cabin close to the heart of downtown Gatlinburg and The Smokies. It would be our pleasure to serve you again in the future. Remember, as a repeat visitor you will save 10% on future stays. Thank you! Cabin was clean and spacious! We enjoyed our experience! We appreciate your kind review, Marithza! It was a pleasure to have you as our guests, and we hope you make plans to visit with us again very soon. Remember, as a repeat visitor you will save 10% on future stays. Thank you! Thank you for your wonderful 5-star review, Jesse! Cupids Arrows is a great cabin, and we hope you will make plans to visit with us again very soon. Remember, as a repeat visitor you will save 10% on future stays. Thank you! The only thing I would recommend to others is bring your own sheets/bedding (mine were scratchy). Overall, the cabin is great and had a wonderful check in/check out process. The staff were nice and helpful. Will be back! Thank you for taking the time to share your experience with us, Haley. We are sorry to hear the sheets were scratchy. Please do not hesitate to contact us should this happen again in the future. We provide 24/7 guest assistance to ensure any need that arises can be taken care of immediately. We sincerely apologize for any inconvenience this may have caused and hope you will consider staying with us again in the future. Property was very clean, nice, & maintained. Thank you for your kind review, Kellam! We are excited to hear you enjoyed your stay and hope you will consider staying with us again in the future.